Tom Brady received a Chevrolet Colorado as his Super Bowl MVP prize, a vehicle a lot of people thought was an odd choice for such a prestigious award. This makes some sense when you consider how much of a marketing push has surrounded Chevrolet’s resurrected midsize pickup, and the resulting publicity around the choice will certainly move some Colorados off Chevy lots. Last year, General Motors gave Malcolm Smith a Silverado High Country, straying away from the trend of giving performance sports cars in the handful of years Chevy has had the contract with the NFL. 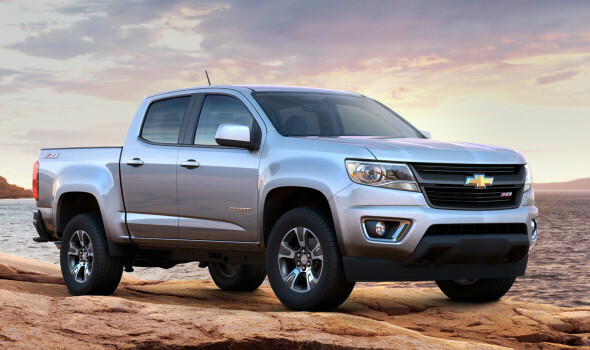 But the Colorado seems to be even further removed from what people have come to expect for an MVP-caliber vehicle. This is not to say the Colorado is not a great truck. It did win Motor Trend’s 2015 Truck of the Year, after all. But with the past awards in mind, we thought we would offer some cars that might have been a more rewarding choice for Tom Brady to give to Malcolm Butler. Because, let’s be real here, Tom Brady doesn’t need more cars. He and Gisele are worth a combined $410 million (most of that comes from the Brazilian supermodel). And yes, we know GM has the contract with the NFL, so a lot of our picks aren’t actual possibilities. 10. With Tom Brady winning the Super Bowl MVP this year, it’s hard to think of a vehicle that could actually live up to the luxury a dynasty quarterback and his supermodel business-mogul wife have come to know. So let’s think about what Malcolm Butler might enjoy in terms of luxury. The Lexus ES 350 epitomizes the luxury sedan. It strikes all the right chords when it comes to style and sophistication, and it truly is a prize worth winning. We’re sure Malcolm Butler isn’t complaining about getting any car for free, but getting the ES 350 would be unreal. 9. The Kia K900 made big waves last year when NBA star LeBron James bought one and loved it so much he started promoting it for Kia. Sure, the K900 may not command the same price tag as its competitors, but that is by no means a bad thing. Starting at $54,500, the K900 is a real bargain considering all the goodies and luxury it affords (think a 9.2-inch navigation screen, panoramic sunroof, and leather—lots and lots of leather). While some football stars may scoff at the thought of driving a Kia, if the K900 is impressive enough for a 2-time NBA Finals MVP to buy one, it is absolutely good enough to give to someone like Drew Brees, who sadly didn’t win a car when named Super Bowl MVP in 2010. 8. The Toyota 4Runner is a beast of an SUV. Built with the hardest of hard-core off-road enthusiasts in mind, the 4Runner can satisfy anyone’s adventurous or luxurious needs. It is a great fit for any athlete, bringing a great balance of adrenaline and near-opulent comfort. It is an absolutely huge vehicle, with 89.7 cubic feet of potential cargo space and available seating for 7 passengers. With that much comfort and performance ability, the 4Runner would be a fitting prize for an NFL Super Bowl MVP. 7. The Porsche 911 is often associated with European “football” MVPs (Cristiano Ronaldo is a proud owner), but why can’t a real football MVP have one as well? Sure, like soccer, the 911 is sleek, refined, and from Europe. That’s about where the similarities end, however. Pop the trunk (on the 911 Turbo S) and you’ll find a 560-hp 6-cylinder engine staring back at you. Oh, and it will get you to 60 in 2.9 seconds. We’re not saying soccer players don’t deserve their 911s, but there’s only one athlete who can put up strength and speed numbers similar to that of the 911, and his name is future Super Bowl MVP Rob Gronkowski. Doesn’t he deserve a car (almost) as wild as he is? 6. If you remember the dark time when New England did not rule the football world, you probably remember seeing Malcolm Smith take home a shiny new Chevrolet Silverado 1500 as MVP of Super Bowl XLVIII. What makes the Silverado such a great pick for a man of that stature? First of all, it’s big, really big. The front seats offer more than enough room to accommodate even the biggest of MVPs and their non-MVP, football-playing friends (step up to the Crew cab and there’s plenty of room for even more large friends in the back). On top of actually being able to fit an MVP, the Silverado is tough. How tough? Just like Julian Edelman, the Silverado wouldn’t bat an eye after getting trucked by Kam Chancellor. Add the available 420-hp 8-cylinder engine and you’ve got a truck any Super Bowl MVP would be proud to own. 5. Like Super Bowl XLV MVP Aaron Rodgers, the BMW X5 is an American of German heritage. Hailing from Greer, South Carolina, the X5 offers a trifecta of luxury, utility, and style. Sure, it’s not the flashiest car a Super Bowl MVP could drive, but for the MVP who wants a sensible, comfortable ride that still looks good picking up the kids and dogs, nothing beats it. Oh, and it’s pretty fun to drive, too. Thanks to an available 4.4-liter 8-cylinder pumping 445 horses to all 4 tires (on xDrive trims), the X5 handles like a dream and scoots to 60 in just 4.6 seconds. How ’bout them Bimmers? 4. Arguably the most popular American sports car ever, the Ford Mustang would make a great choice for the MVP of the most important sporting event of all time. The Mustang happens to be just 1 year older than the Super Bowl (with the Mustang starting production in the ’65 model year and the first Super Bowl happening in ’66), and we love the idea of Ford giving a Mustang away every year since its inception to the Super Bowl MVP. We’re sure Bart Starr would have loved to win a ’65 Mustang fastback, as much as Tom Brady would love to have won a Mustang GT 50 Years Limited Edition. This would have been too perfect. It’s a shame Ford didn’t get the contract with the NFL to give away cars when it had the chance, but GM has certainly made the most of it. 3. Five of the last 12 Super Bowl MVPs have received a Cadillac Escalade (or Escalade ESV), and to be quite honest, it remains one of the best rewards available for an MVP. In many ways, the Escalade embodies the attitude that surrounds the NFL. It’s big, expensive, appealing, and highly over the top. With its large body (203.9 inches long), seating for 8, and 15.2 cubic feet of cargo space behind the rear seat, the Escalade can carry half the offense to the Super Bowl after party. And Cadillac doesn’t often skimp on luxury additions. A ton of room, comfort, tech, and other luxury goodies makes the Escalade a prize worth winning. It really was the perfect gift to represent the NFL’s most clutch players (Tom Brady, Hines Ward, Peyton Manning, other Manning, and Santonio Holmes). 2. If there were ever a car to represent the sheer power of an NFL player, it would certainly be the Dodge Challenger. With trims like the SRT 392 and Hellcat producing up to 707 hp, the Challenger epitomizes the explosive power of NFL players. It’s the car equivalent of a powerback, and we’re sure that if Chrysler held the contract with the NFL, the Challenger would be the car they’d hand to the MVP (it would be especially appropriate if Marshawn Lynch or LeGarrette Blount ever won the award). Dodge even centered its Super Bowl marketing effort around the Challenger in its Wisdom commercial spot. It’s an interesting one. 1. There are few things that scream “America” louder than the Super Bowl. One of them is the Chevrolet Corvette. Since its introduction in 1953, the Corvette has found itself the stuff of dreams for many young Americans. While some grow up to purchase their dream Corvettes, Chevy sometimes gives them to others who go on to take command of the world’s most important game. Super Bowl XLVII MVP Joe Flacco knows this, as does another quarterback who won a grand total of 6 games this season with New Jersey. Like a good Super Bowl MVP, the Corvette talks a big game and packs an even bigger punch. So do we wish Tom Brady got a Corvette instead of a Colorado? Absolutely not. While we love the Corvette and do think it’s the most fitting car for a Super Bowl MVP, Tom Brady might not have been named MVP if not for the heroics of Malcolm Butler. Thanks to Brady’s generosity, Butler will get this year’s prize, and Butler loves the Colorado. What cars do you think are most fitting for a Super Bowl MVP? Shopping for an MVP-caliber car this weekend? This entry was posted in Car Industry News, Car Lists, Car Minded, Domestic Cars, General Chat, Trucks & SUVs, United States and tagged 2015 BMW X5, 2015 Cadillac Escalade, 2015 Chevrolet Corvette, 2015 Chevrolet Silverado 1500, 2015 Dodge Challenger, 2015 ford mustang, 2015 Kia K900, 2015 Lexus ES 350, 2015 Porsche 911, 2015 Toyota 4Runner, BMW X5, Cadillac Escalade, Chevrolet Corvette, Chevrolet Silverado 1500, dodge challenger, Ford Mustang, Kia K900, Lexus ES 350, Porsche 911, Toyota 4Runner. Bookmark the permalink. ← Would You Buy a Porsche With a Sketchy Past?